This instrument is made up of two superimposed discs of different diameters. Part of the circumference of the smaller disc is indented, and it has a short pointer. 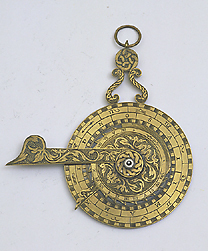 A long ornate pointer is mounted above the discs.